Fast4wdOgilvy has an "around the world" healthcare solution, and uses a hot air balloon as their company's icon. At a June 2006 trade show in Philadelphia, Sean built a 4-foot tall model of a hot-air balloon entirely in the company's branded color. The narrow-bottom of a hot air balloon makes a model like this very challenging to build! All of the weight of the model presses onto the tiny basket at the bottom, and without support, the whole model could tip over very easily. To solve these problems, Sean had an internal metal armature and a sturdy base created before the trade show. He attached the model to this metal "skeleton" as he built, checking stability and balance constantly. A one-foot-tall miniature, above, was used as a guide while building the 4-foot-tall model. The balloon was built over the course of the three day trade show. Visitors to the booth helped the model along by building large rectangular blocks that Sean incorporated into the final model. Simple building instructions and loose LEGO bricks at the front of the booth helped make it easy for anyone to participate. Towards the end of the second day, the metal armature was further enclosed and the weight of the model (over 150 pounds!) rested on the metal frame. Sitting on the table, the model was now taller than Sean! By the middle of the third day, the model was completed! Trade show patrons had been returning to the booth over the course of the three days to check the progress of the model and were given miniature 2-inch-tall hot air balloon models that they could take home. 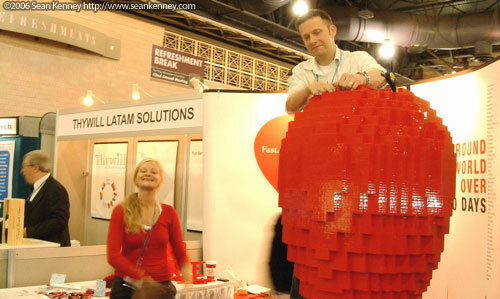 After the show ended, the giant LEGO balloon was crated and shipped to Ogilvy's main office in New York City.